One of the big surprises from the Oscar nominations are two high profile nominations (Best Actress, Melissa Leo and Best Original Screenplay, Courtney Hunt) for some little film most have never heard of before, “Frozen River”. “Frozen River” was the Grand Jury Prize winner at Sundance last year, a small release later that year barely made a dent in the public consciousness. But those critics who raved about the film a year ago never forgot it for their year end best of lists. It’s a sharply written story of depressed low income America. We're in upstate New York near the Canadian border. It’s winter and Ray Eddy (Melissa Leo) is at the lowest point of her life. Her husband and father to her two kids (5 and 15) has taken their new home's downpayment and buggered off to gamble it all away. Ray is penniless with a deadend job, feeding her kids popcorn and tang for dinner. She scours the frozen lands for her husband’s car which if sold could help get her that house. 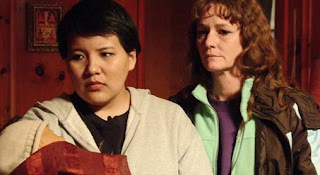 The car is in the company of a young Mohawk girl Lila (Misty Upham) who makes money delivering illegal aliens through the unregulated Mohawk reservation border. With no other options Ray joins Lila in a number of border runs delivering immigrants in her trunk for cash. Eventually the authorities catch up to her which forces Ray to make lifechanging decisions for the betterment of her family. It’s no surprise the film didn’t find an audience. It’s dreary and depressing, one of those ‘feel-bad’ movies which leaves you utterly depressed when it’s over. But there’s certainly a place for these kinds of films, and I freely admit I like to be beaten down in the cinema every once in a while (I am a fan of Lars Von Trier after all). The two strengths of the film indeed are it's star Melissa Leo and the screenplay. Hunt examines the character of a desperate mother who has to put food on her table at all costs, and shapes the character through a series of morally questionable trials. At times it feels like a noir, an average Jane character tempted by an innocent crime and a narrative driven by her reactions to the changes in her circumstances. It's also a film about the unlikely developing friendship between Lilo and Ray and the loyalty they earn from each other. Director Hunt recognizes the power of Melissa Leo’s coarse face and internalized emotions. The opening shot tells us what kind of a film this is with a lingering close-up of Leo’s face, without make-up, dirty fingernails, yellowing teeth, smoking a cigarette. Ray’s character holds all the weight of the film and Leo delivers a deserving Oscar-nominated performance. Unfortunately the film is let down by most of everyone else in the film. And it's an almost insurmountable crutch. Many of the supporting actors feel like they’re just about to look into the camera by accident. When we're supposed to be deeply involved in Ray's journey we're continually distracted by bad acting. The film is also short on some of its internal logic. Ray’s money situation seems solvable considering she owns two cars. The portrayal of the immigrants who cross the border are props more than characters and are uninvolved in any decision making. At one point a Pakistani couple get into the trunk of Ray’s car. Ray’s throws away their duffle bag, without even looking in it. Of course there’s something vital which belongs to the couple, something which realistically they would never have let Ray touch let alone throw away in the first place. It’s inconsistencies like these which often overshadow Leo’s performance, which in the end is Oscar-worthy. Though smart money should still be on Meryl Streep, the mere fact Leo is even in the company of high-priced Hollywood talent like Streep, Jolie, Winslet etc is a minor miracle and a win for all independent films. I thought the whole story was raw and unimpressive as well. There was absolutely nothing new about the whole 'impossible friendship' thing as well as the family drama itself (little boy asking for their house from Santa, elder brother obsesses over a small device from his father), nor about the racial subtext. Leo's performance was decent but not strong enough to carry the whole film with all these major flaws. I would still prefer her over Meryl Streep's over-dramatized nun though.